TYSONS CORNER, Va.--(BUSINESS WIRE)--Mar. 12, 2018-- MicroStrategy® Incorporated (Nasdaq: MSTR), a leading worldwide provider of enterprise analytics and mobility software, today announced it has renewed the lease for its Fairfax County headquarters at 1850 Towers Crescent Plaza, and plans to invest $6 million in capital improvements. The investment includes plans to hire 300 employees for R&D, Sales, Marketing, and Services roles over several years, and undertake initiatives to improve the facilities and workspaces at its headquarters location. 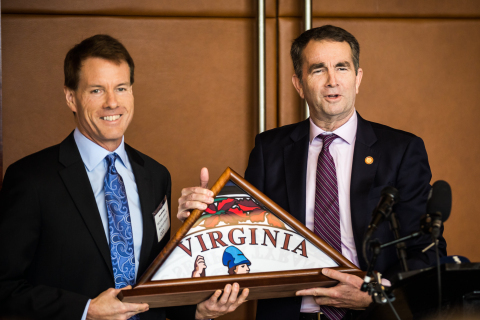 MicroStrategy is committed to helping to ensure Virginia remains at the forefront of innovation and a top place to do business in the United States. The renewed lease reflects MicroStrategy’s dedication to supporting the local economy and hiring more STEM talent from the community and the region’s universities. MicroStrategy is strategically located in Northern Virginia, the cornerstone of technology innovation on the East Coast. With its close proximity to the nation’s capital and international business community, MicroStrategy is well positioned to grow existing relationships and forge new business ties across the Virginia, Maryland and Washington, D.C. area. In addition to MicroStrategy’s state-of-the-art facilities, frequent social events and many corporate activities, MicroStrategy employees have access to an extensive public transit system, and can take advantage of world-class restaurants, shopping, entertainment venues, museums and cultural sites, making it a great place to work, live and play. Learn more about MicroStrategy's career opportunities today. Members of the media can learn more about MicroStrategyhere. MicroStrategy is a registered trademark of MicroStrategy Incorporated in the United States and certain other countries. Other product and company names mentioned herein may be the trademarks of their respective owners.